There has been a lot of feedback from my post describing my realization my confidence needs work after a recent trail ride. Some of the feedback has been supportive, but a lot of equestrians have been surprisingly negative saying that I shouldn’t be riding a horse I don’t trust or that my friends shouldn’t push me to do things that I am not comfortable with. These are all fair points and I absolutely agree with them. However, that is not the case in my situation. My story in A Long Way to Go, was to reveal my own anxiety and show how I tend to overreact to situations. Perhaps it wasn’t written as well as it should have been. I tend to rationalize my horse’s behavior whether good or bad. I overthink everything. Sadly, this is my personality. I try to find reason where perhaps there is none at all. The day in question the horses had been inside for days due to the polar vortex. With a break and warmer weather, I asked my friends to come on a hack with me into our extensive trails. I love hacking with others but tend to long slow hikes for pleasure with the occasional walk, canter, or gallop thrown in. Since I’ve owned Ferrous the last year these are the types of trails we have done and while he is happy, alert, and calmly forward he is never hard to slow or encourage to graze and wait for others. His walk is more of a march and he often outpaces the others without trying. I would like to note that teens have ridden him regularly on the trails without issue. On this day everything was fine until we took a new route into the woods. We haven’t done it before together and he was anticipatory trying to break into a trot immediately. I brought him back and he listened, but he was frustrated with me. How can I tell? Because I know my horse. I listen to my horse and I trust my horse. So why was I nervous? Because I didn’t trust myself. Period. 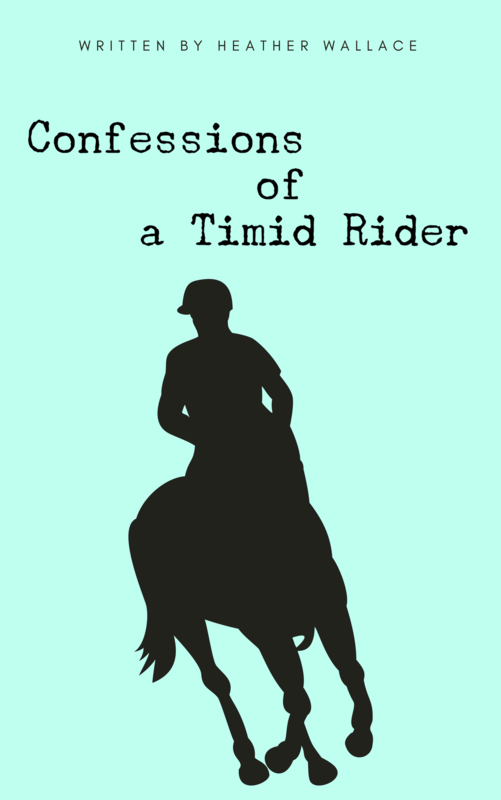 I refer to myself as The Timid Rider not because I can’t ride. I have ridden many years, in many situations, and done so very well. There haven’t been any situations that I cannot handle, although I choose not to put myself in a situation if I can help it. For example, I would never willingly ride a horse on a trail that I didn’t know or feel comfortable. I am a careful rider. I refer to myself as timid because I have anxiety and overthink everything. It is not my horse that is the problem, it is me. His happiness to be outside and my tension created a hack that I found nerve-wracking and made me realize that while I am slowly increasing my confidence, I have a long way to go. I turned a corner and realize that I’m increasingly more confident in the saddle but I do have tense moments that make me realize I still need to work on myself. My biggest problem is in my own head. It is not all the time, but it is there and crops up when I least expect it. This is the nature of my own mental fortitude or lack thereof. I know that I am better than my nerves. I know that I can handle a situation should it crop up. But that doesn’t mean I like to put myself in tricky situations. I wouldn’t take my horse on the trails if he was dangerous or didn’t listen. Period. My friends are trainers and wouldn’t tell me to keep going if there was anything truly wrong. Period. I would have turned back on my own or forced an alternate route if I truly felt unsafe, not just wary. So for those of you just getting to know me, I hope this is clearer to you. I love riding horses and 98% of the time it is fantastic and timid-free. But I still have moments where I question myself or my skill and need to relax and push through. Trust me, if it is really bad I will dismount. I’ve done it before and will do it again.